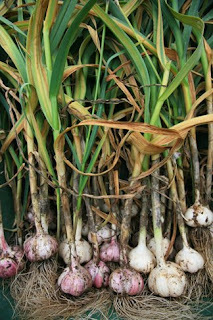 GARLIC: Only North American garlic. No Chinese garlic. It grows so readily here, from what I can tell, preserves well, so it's available locally pretty much year-round. I have no idea what they're doing to it in China. Maybe nothing, but that's not the point. It is a false economy to say it is cheaper and more efficient to grow garlic for me in China, then ship it all the way around the world. So... garlic, as local as possible. "Local" being this huge continent. Ontario if possible, farmer's market fresh hardneck if possible. 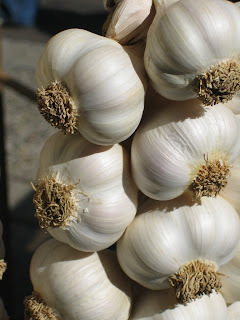 The "neck" of garlic, by the way, is the core bit in the middle that you might not even have noticed if you've been buying non-Ontario, non-organic garlic. Most commercial garlic is softneck, and I'm not sure what the flavour differences are between the two types. But I do know, or believe, that hardneck grows best here. Maybe next year, I'll even plant some for myself... again. (tried it the first year and failed). 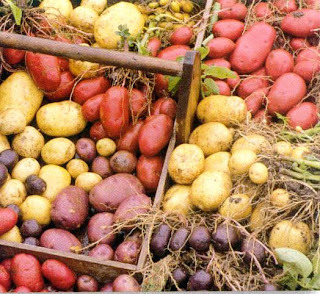 Inspired by Michael Pollan's The Botany of Desire and other discussions of pesticide use in commercial potato growing, I think we'll try cutting out the pesticide 'tatoes altogether. I was a little daunted by this when I asked if they had organic potatoes at Sobey's (Clark & Hilda store) and the produce guy said they used to but at $8 a bag, they didn't sell very many. But today they had Canadian-grown organic President's Choice organic potatoes, both russet and red, at Fortino's for $2.99 (maybe $3.99? ), so I bought a bag of each. This may be harder than the garlic to keep up all winter long, but we shall see. 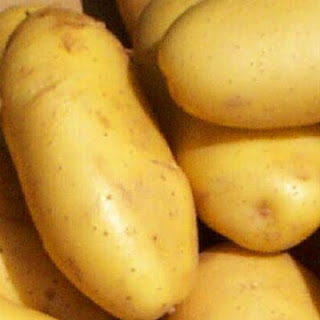 The real conundrum with insisting on organic may not be buying the potatoes themselves, but the products that contain potatoes that aren't organic: tinned veggie soups, heck, the tinned teeny-weeny potatoes that we all love so much with our superstore roast chicken. Apparently many consumers who buy organic don't really think through all the sources of their inorganic veggies, at least according to another book I read recently, Organic, Inc. (forget the author's name). Convenience foods, especially, are often accepted at face value even though they're made of the very same non-organic produce the person would ordinarily turn up his or her nose at.